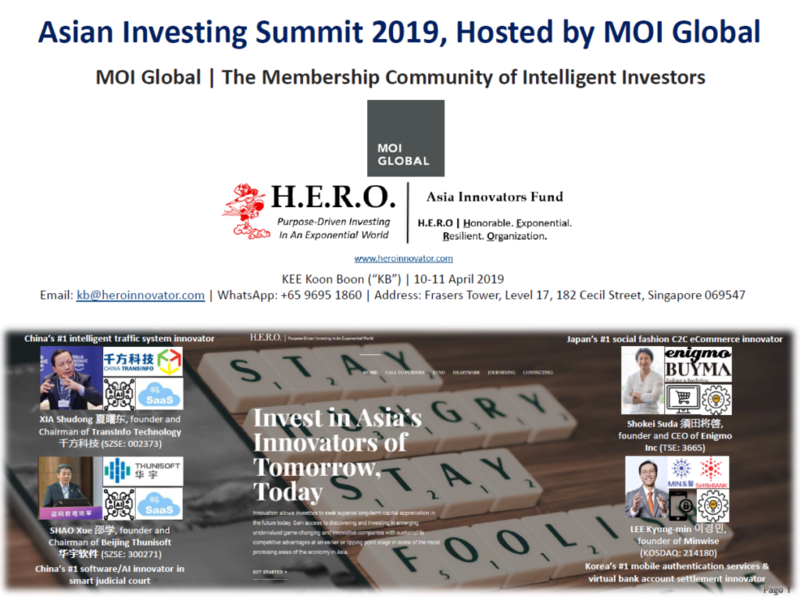 MOI Asian Investing Summit 2019 (10-11 April) – VALUE 3.0: Avoiding the Ever-More Value Traps & Investing in a Selected Under-the-Radar Group of Winners with Exponential Edge – H.E.R.O. This week, we like to share our presentation material for the upcoming MOI Asian Investing Summit 2019 (April 10-11). Linear Vs Non-Linear Business Model: Foxconn/Hon Hai Vs Appen – Both With an Army of 1 Million Workers? (1) Beyond Moat Competitive Advantages: What’s the Exponential Edge? | (2) Variant Perception: What’s the Difference in View? Why Mispriced? | (3) Why Now? Fundamental Catalysts? | (4) Risks: What Can Go Wrong? | (5) Why Undervalued? Why Can It Doubled Over the Next 3-5 Years? ← H.E.R.O.’s Journey in Tech (29 March 2019) – AI Powers a New Innovation Machine; How Collaborative Platforms and Ecosystems Are Changing Innovation + Ask yourself these five questions to find your best self; Finding an “alter ego” for yourself is a self-development strategy that can help you navigate the struggles that life presents with more grace and more grit.